Preschool is not an area in which I am most familiar with so I have to refer to my wife who is an Early Childhood Education Instructor at our high school. She has taught me a lot about what is importance of early education instruction in toddlers and preschoolers, and why it is important to constantly observe children. They show you what they know. One aspect that is important when it comes to preschool is to communicate with parents about how their child is at home, and letting parents know how their child is at school. By having that open communication teachers and parents can get a whole picture of the child. Early Childhood Educators know what the average toddler and preschooler should be doing by every age. Some times a few children will stick out because of their talents. Here are a few characteristics that preschool teachers and parents should notice because these aspects are possible indicators of giftedness. When parents and early childhood educators notice multiple aspects listed above there needs to be an intervention to make sure the child is put into gifted services. The best form for this is acceleration. In our schools we will quickly accelerate students who accelerate in music, the arts, and even sports. We need to be more fluid with our academic classes as well. I believe this also applies for preschool students as well as the elementary, middle, and high school students. Research shows that the earlier children start school the better chances of these children to have an increased academic success in elementary school and it widens further in middle and high school. It also shows that if high ability students aren’t able to accelerate at the level they need to they can begin to show behavior problems. Finally, research also shows that if parents create a learning environment that is fun can make a huge difference to learning throughout the child’s life. There are 6 things that teachers and parents can do to help find or develop high ability children. Teach responsibility to young children. Young children need to be exposed to new and exciting learning opportunities often. The more parents and teachers do this they are making an investment for a better life for their children. What does your school do to help find and nurture high ability preschoolers? I used Parenting Gifted Children book from NAGC as a resource for this post. I encourage you to check it out. I was looking through my feedly.com feed this morning trying to get a feel for what was out there in the blogosphere. I scrolled down through the several hundred blogs I follow and a few thoughts hit me. One thought was the fact that I follow some of the most talented bloggers on the face of the earth in the fields of Education and Gifted Education. The other thought was a little more profound: what would happen if a large handful of these talented bloggers coordinate their skill and talent to flood the blogosphere with blogs based on a theme. Last October or November I participated in a Blog Hop. Basically a blog hop is volunteers would submit a blog post based on a theme to one central place and then people could hop through the blogs. This is a great way for people to read the ideas of others on a theme. It also helps to gain more readers and followers of your blog. 1. Post your blog on your website, and email (mr.jeffreyshoemaker@gmail.com) or tweet (@jeff_shoemaker) a link to me, and I will create a post with everyone’s blog link. 2. You can write your post and email (mr.jeffreyshoemaker@gmail.com) it to me. I will post it to my blog as you being the guest blogger. I hope that you join me in doing this. I can’t wait to read, share, and learn with you as these blogs go live. Topic: What is your favorite aspects of teaching gifted children? Send a link, or tweet me your link to your blog post by Thursday Feb. 20th. I have found a great treasure in education: Project based learning. In my wife’s school, they are transitioning from a traditional to a more project based learning approach to teaching. They are also going with a New Tech style of teaching, they are trying to develop a more business-like atmosphere in the classroom, where each students has their own computer (1:1 student : computer) , and work in small groups on projects that have real meaning. The projects they are working on are scenario based. Teachers give their students an entry document that explains their project, and who what company they are doing this project for. This is all very business-like and modern. I have to admit I think it is great. They have students working on real-life projects. What I like about this kind of teaching is that goes beyond the project to the outside world. Students are engaged, they are using technology and social media to connect with people in their school and outside their school about these projects. They also have their own social network called ECHO, which students and teachers can connect throughout the day. So, how can I get that kind of experience into my gifted classes? I know that I have some limitations, but I have to work around those limitations just like a person who is the owner of a small business might. This year, I have decided that I am going to go with a scenario type assignments to give my students the illusion that the project before us is more realistic, hopefully more authentic, and allows us to work more effectively. The letter is where our assignment is being explained to us. It is an outline of our goals, why we have the assignment and what who wants the final product. This letter is written in a a formal letter from one business to another. This is the form where we begin to gather what we know about the topic of study, and what we need to know or want to know. This is to help us get organized. As a class we will begin to break down the assignments into manageable parts. Each group will take a part of the assignment to do. They will choose what they want to work on based on their strengths and interests. After the project is underway, I sit down with each group to make sure that they are working, and their part of the project is coming along. I also have whole class meetings so the students can see how each group is progressing. During these meetings, I try to show the students how their projects make up one large project. We also review the goals to make sure that the goals are being met, and students can see how their projects fit together. If there needs to be some revision, this is the time it happens. As each group is finished with their project, I have will have each group report out on their part of the project. We review what the goals of the project are to make sure that goals were met. Finally as a whole class, we work on putting this project into a meaningful letter back to the company of the original letter. We share what they learned, what they did to met the goals of the original letter, and the final outcome of the project was. I don’t know if this is a perfect kind of way to teach my students, but it gives me some direction to plan toward as we move though a project. I also believe that students need to have meaningful projects that allow for cross-curricular connections. Students need to see how math, science, reading, writing, and the social sciences work together. I also believe that this kind of teaching will allow students to feel empowered because they can use their creativity where their strengths are. They can also pull in the strengths of those around them working on the task at hand. 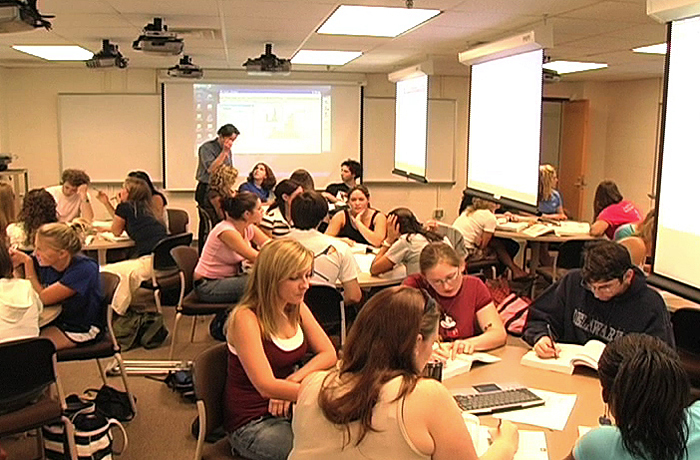 Students also get the chance to work in a group. Some gifted students have a really hard time doing that. I want those students to see that there are some occasions that they will have to work with a partner or small group to get things done. In closing, this teaching style is still evolving for me. It may change as my students work through a few projects. I will definitely write more about this in the future. Here is a statement I often receive from classroom teachers, “He is failing my class! How is he gifted?” I often tell them that he is just suffering from under achievement. What is under achievement? Basically is it when a gifted learner isn’t meeting their academic potential. When we have a classroom that is full of students of various academic skill levels you have to be prepared for students to finish at different times. I have mentioned the book Teaching Gifted Kids in the Regular Classroom by Susan Winebrenner as a great resource for students who need to be challenged a little more. I tell teachers this little fact: gifted education is good education. Whatever can work in my classroom with gifted learners it will work with average learners. We just need to be prepared to meet the needs of all students. Just because a student is gifted doesn’t mean he or she needs extra work. They need challenging work. That’s where you need to be prepared. Teaching Gifted Kids in the Regular Classroom has so many ideas that you can use to be adapted in different ways to give some variety to gifted and average learners to battle under achievement. One of the jobs a teacher has is cheerleader. We know that children learn differently and in different ways. We need to find what that is. Gifted learners can be some of the most fickle people. At one moment that have it, the next they are falling apart. We need to motivate students. We also need to teach students what motivation is and how to motivate themselves. If teachers can make the topic as interesting as possible, then they will be motivated to work harder. Also, teachers need to make the goals clear. Some students are motivated by goals. If so, use it. This kind of thinking goes back to teacher preparedness with meaningful lessons and a knowing of your students strengths and weaknesses. Remember every child is motivated differently. Find what it is, and use it that will help your students fight under achievement. One of the things that I think makes or breaks a classroom is climate. I always start out my year with some expectations, and I set the mood of the classroom. One thing that I constantly work on is the climate. I have expectations for my students, their behavior, the products to turn in, and working with each other. I try to make these are clear as possible and easy to understand. When the climate for the room is to strive for success, students will follow it. Teachers have to get students to buy into it. You do that by being authentic. Teachers have to show they are serious about their success on the project they are working on and the ones they will work on it future in your class and in others. My wife, Tina, is so good at this. My wife teaches Early Childhood Education (ECE) to junior and senior high school students. She gets them to buy into the fact they are a family and they represent not only their school, but their profession as ECE students and future teachers, their program, their teacher, their classmates, and themselves and family. Once they have mindset, her students change and really have a love of what they are doing in school and in the community. My wife has over 80% of her seniors every year go into college to receive degrees in ECE. That’s how under achievement is fought. I know there are other conditions that may lead to a student to suffer from under achievement. There are a wide variety of tests that can be taken and analyzed. Gifted children are complicated. I feel that when we talk to educators, advocates, and parents who have a love for gifted children we will can and share what we see, what we hear, and what we know and collaborate with each other gifted children will be better off. I got this off of the NAEYC website. This is very good. Thought I would share. We are always looking to show how Social Me dia can help you. This is one of the best that I have seen. This slide show talks about Twitter, Facebook, and various blogs. They also discuss how to use each one, and some key terms so that when you decide to use one of these social media outlets you have an idea how to use it.